The Marcellus Shale is the largest gas reserve in the United States, stretching across 104,000 square miles and extending from Marcellus, New York, into Pennsylvania, Maryland, Ohio, and West Virginia. 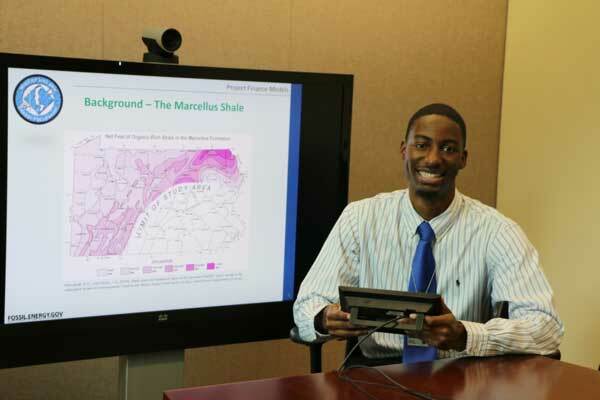 As one of the most valuable natural resources in the U.S., Allante Harrison, a Mickey Leland Energy Fellowship (MLEF) participant, was given the task of creating a model for the U.S. Department of Energy (DOE) to determine whether removing gas from the Marcellus Shale was an economically responsible decision. Alongside his two mentors, Joseph Giove III and Peter Rozelle, Ph.D., in the Division of Large Carbon Management Projects at DOE Headquarters in Germantown, MD, Harrison helped construct financial models for gas wells in the Marcellus Shale. Prior to participation in the MLEF program, Harrison had no knowledge of shale formations and the different calculations used to create models to study and assess them. Now he feels he is knowledgeable in many of today’s pressing energy topics and wants to use his new skills to advance technology in the energy sector. Harrison completed his bachelor’s degree in mathematics at Fort Valley State University in 2014 and is now working toward a second bachelor’s degree in mechanical engineering at the University of Arkansas through the Cooperative Developmental Energy Program. His goal as a Fellow in the MLEF program was to gain relevant energy experience and gather insight into a possible career path. In the future, Harrison sees himself working as an engineer in either the government or the industry and contributing to society in a significant way. The focus of MLEF is to open up STEM career field opportunities to minority and female students. The Mickey Leland Energy Fellowship program is administered through the U.S. Department of Energy’s Oak Ridge Institute for Science and Education (ORISE), which is managed for DOE by ORAU.